Learn Python 3 From Scratch, Build Your Own Network Scripts and Upgrade Your Network Engineering Skills! Updated 2018. Master all the Python key concepts starting from scratch. No prior Python knowledge is required! Apply your new Python skills to build various tools for network interaction and make your job easier. Use Python for building an interactive subnet calculator with a user menu. Use Python for connecting via SSHv2 to any network device and perform various tasks. Use Python for capturing, decoding and analyzing network packets and building a basic network sniffer. Create Python apps to automate daily networking tasks like querying and configuring devices and configuration file management. Get the full Python code of 5 great network applications and customize them according to your needs. Ask for a raise at your current job or apply for a better job using the skills gained from this course. You should have a great desire to learn Python programming and do it in a hands-on fashion, without having to watch countless videos filled with slides and theory. You should already be familiar with networking concepts like: Switching, TCP/IP, CLI, SSHv2, Telnet, OSI Layers. You are going to use only free software throughout the course: Python 3.7, VirtualBox, Arista vEOS, Notepad++. All you need is a decent PC or laptop (2GHz CPU, 8-16GB RAM) and an Internet connection to download the free tools. No prior Python knowledge is required! This training teaches your everything, from scratch. ✔ What others have to say about my Python courses? "What an incredible value and learning experience!" by Sean A. "Excellent material. Kudos to a great instructor with a vast level of creativity." by Anthony W.
"I can say this man is going on smoothly and perfectly, explaining in the most empirical/foundational way." by Kolapo A. ✔ Why would you take this course? Do you want to become a Python Developer without having to spend a lot of money on books and boring theoretical courses? Are you a network professional who wants to start automating network tasks using Python? Or maybe you're seeking a raise or even a career change? Join thousands of successful students who have decided to learn Python, upgrade their networking skills and boost their careers using this 100% hands-on course! ✔ What's this course all about? 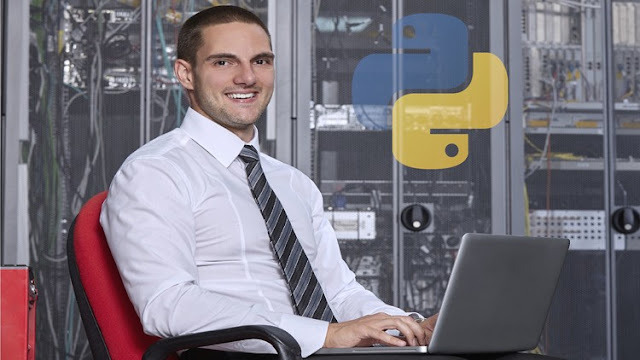 Python Network Programming (version 3.7) course aimed not only at network professionals, but at anyone having little or no experience in coding or network automation and a great desire to start learning Python from scratch. This hands-on Python Network Programming training takes you from "Hello World!" to building complex network applications in no time. Sounds unbelievable given your current programming experience? Well, it's true! How? First, you will learn and practice every Python 3 key concept, which is explained in one or more video lectures, followed by a short quiz. Each video is filled with relevant examples, in a learn-by-doing fashion and the quizzes will help you consolidate the main ideas behind each Python topic. After laying the foundation (and also exploring some advanced Python topics), you will dive right into the real-life network scenarios and apply your knowledge to build 5 great network tools using the power of Python. Equipped with working files, cheat sheets and Python code samples, you will be able to work alongside me on each lecture and each application. I will provide a virtual machine with all the Python modules already installed and also the full code for each application, so you can save time and start coding and testing on the spot. We will use emulated Arista vEOS switches in VirtualBox to test our Python apps in a network environment, so you can see the actual results of running your Python code. I encourage you to learn Python, an amazingly beginner-friendly programming language and take your network engineering job to a higher level of automation. ✔ Is this course regularly updated? Next Update: December 20th, 2018 - Re-filming the network applications part of the course, upgrading to Python 3. Last Update: November 8th, 2018 - Re-filmed the first 10 sections of the course, upgraded to Python 3 and improved the video quality to 1080p Full HD. ✔ What others have to say about this course? Last week, over 300 students have joined my Python courses. The average course rating is above 4.5 / 5 stars, from thousands of reviews. ⚠ Important information before you enroll! ✔ Enroll NOW and hop on the Python Network Programming train. Let's get started! Network Administrators, Network Engineers, Network Managers, Systems Engineers. Network Quality Assurance Engineers, Network Analysts, Network Professionals. Python Developers Who Want to Apply Their Knowledge in Network Automation.